Android 2.2 introduces support for enterprise applications by offering the Android Device Administration API. The Device Administration API provides device administration features at the system level. These APIs allow you to create security-aware applications that are useful in enterprise settings, in which IT professionals require rich control over employee devices. For example, the built-in Android Email application has leveraged the new APIs to improve Exchange support. Through the Email application, Exchange administrators can enforce password policies — including alphanumeric passwords or numeric PINs — across devices. 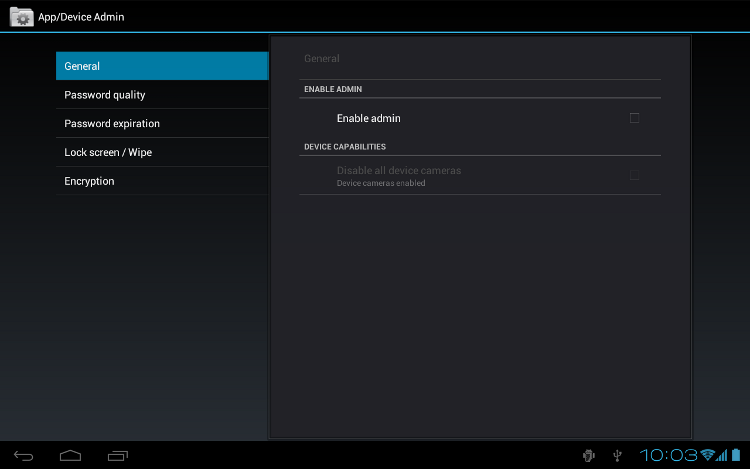 Administrators can also remotely wipe (that is, restore factory defaults on) lost or stolen handsets. Exchange users can sync their email and calendar data. A system administrator writes a device admin application that enforces remote/local device security policies. These policies could be hard-coded into the app, or the application could dynamically fetch policies from a third-party server. Distributing the application through other means, such as email or websites. The system prompts the user to enable the device admin application. How and when this happens depends on how the application is implemented. Once users enable the device admin application, they are subject to its policies. Complying with those policies typically confers benefits, such as access to sensitive systems and data. If users do not enable the device admin app, it remains on the device, but in an inactive state. Users will not be subject to its policies, and they will conversely not get any of the application's benefits—for example, they may not be able to sync data. If a user fails to comply with the policies (for example, if a user sets a password that violates the guidelines), it is up to the application to decide how to handle this. However, typically this will result in the user not being able to sync data. If a device contains multiple enabled admin applications, the strictest policy is enforced. There is no way to target a particular admin application. To uninstall an existing device admin application, users need to first unregister the application as an administrator. The examples used in this document are based on the Device Administration API sample, which is included in the SDK samples. For information on downloading and installing the SDK samples, see Getting the Samples. Here is the complete code for the sample. System administrators can use the Device Administration API to write an application that enforces remote/local device security policy enforcement. This section summarizes the steps involved in creating a device administration application. The ability to respond to the ACTION_DEVICE_ADMIN_ENABLEDintent, expressed in the manifest as an intent filter. The following attributes refer to string resources that for the sample application reside in ApiDemos/res/values/strings.xml. For more information about resources, see Application Resources. android:label="@string/activity_sample_device_admin"	refers to the user-readable label for the activity. android:label="@string/sample_device_admin"	refers to the user-readable label for the permission. android:description="@string/sample_device_admin_description"	refers to the user-readable description of the permission. A descripton is typically longer and more informative than a label. android:permission="android.permission.BIND_DEVICE_ADMIN" is a permission that a DeviceAdminReceiversubclass must have, to ensure that only the system can interact with the receiver (no application can be granted this permission). This prevents other applications from abusing your device admin app. android.app.action.DEVICE_ADMIN_ENABLED	is the the primary action that a DeviceAdminReceiversubclass must handle to be allowed to manage a device. This is set to the receiver when the user enables the device admin app. Your code typically handles this in onEnabled(). To be supported, the receiver must also require the BIND_DEVICE_ADMINpermission so that other applications cannot abuse it. When a user enables the device admin application, that gives the receiver permission to perform actions in response to the broadcast of particular system events. When suitable event arises, the application can impose a policy. For example, if the user attempts to set a new password that doesn't meet the policy requirements, the application can prompt the user to pick a different password that does meet the requirements. In designing your device administration application, you don't need to include all of the policies, just the ones that are relevant for your app. Base class for implementing a device administration component. This class provides a convenience for interpreting the raw intent actions that are sent by the system. Your Device Administration application must include a DeviceAdminReceiversubclass. These classes provide the foundation for a fully functional device administration application. The rest of this section describes how you use the DeviceAdminReceiverand DevicePolicyManagerAPIs to write a device admin application. To create a device admin application, you must subclass DeviceAdminReceiver. The DeviceAdminReceiverclass consists of a series of callbacks that are triggered when particular events occur. One of the major events a device admin application has to handle is the user enabling the application. The user must explicitly enable the application for the policies to be enforced. If the user chooses not to enable the application it will still be present on the device, but its policies will not be enforced, and the user will not get any of the application's benefits. The process of enabling the application begins when the user performs an action that triggers the ACTION_ADD_DEVICE_ADMINintent. In the sample application, this happens when the user clicks the Enable Admin checkbox. When the user clicks the Enable Admin checkbox, the display changes to prompt the user to activate the device admin application, as shown in figure 2. Below is the code that gets executed when the user clicks the Enable Admin checkbox. This has the effect of triggering the onPreferenceChange()callback. This callback is invoked when the value of this Preferencehas been changed by the user and is about to be set and/or persisted. If the user is enabling the application, the display changes to prompt the user to activate the device admin application, as shown in figure 2. Otherwise, the device admin application is disabled. The line intent.putExtra(DevicePolicyManager.EXTRA_DEVICE_ADMIN, mDeviceAdminSample)states that mDeviceAdminSample(which is a DeviceAdminReceivercomponent) is the target policy. This line invokes the user interface shown in figure 2, which guides users through adding the device administrator to the system (or allows them to reject it). DevicePolicyManageris a public class for managing policies enforced on a device. DevicePolicyManagermanages policies for one or more DeviceAdminReceiverinstances. DevicePolicyManagerincludes APIs for setting and enforcing the device password policy. 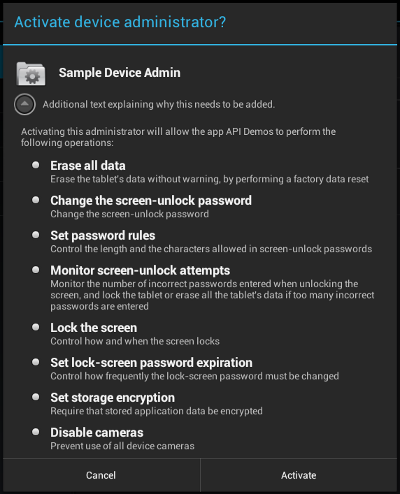 In the Device Administration API, the password only applies to screen lock. This section describes common password-related tasks. Beginning with Android 3.0, you can use the setPasswordHistoryLength()method to limit users' ability to reuse old passwords. This method takes a length parameter, which specifies how many old passwords are stored. When this policy is active, users cannot enter a new password that matches the last n passwords. This prevents users from using the same password over and over. This policy is typically used in conjunction with setPasswordExpirationTimeout(), which forces users to update their passwords after a specified amount of time has elapsed. You can use the DevicePolicyManagermethod wipeData()to reset the device to factory settings. This is useful if the device is lost or stolen. Often the decision to wipe the device is the result of certain conditions being met. For example, you can use setMaximumFailedPasswordsForWipe()to state that a device should be wiped after a specific number of failed password attempts. The wipeData()method takes as its parameter a bit mask of additional options. Currently the value must be 0. Beginning with Android 3.0, you can use the setStorageEncryption()method to set a policy requiring encryption of the storage area, where supported.